Evacuated families arrive by trucks and tractors at a relief center in Dongxiang, China, on Sunday. (CNN) -- The death toll from heavy flooding in southern China rose to 147, as authorities forecast more rain in coming days. In addition, the mud flows and floods have left 93 people missing and prompted the evacuation of more than 1 million people, the state-run China Daily newspaper reported, citing the Ministry of Civil Affairs. The heavy rains have affected more than 15 million people in nine of southern China's provinces, including Fujian, Jiangxi, and Hunan provinces, the ministry told China Daily. Economic losses have topped 19.7 billion yuan (U.S. $2.9 billion), officials said. 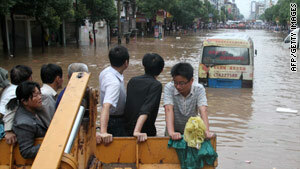 The havoc has affected 784,200 hectares of crops and flattened more than 178,000 houses, China Daily reported. Officials urged local governments to boost anti-flood measures to prevent further damages. Three teams of experts dispatched by the office and the nation's Ministry of Water Resources to Guizhou and Zhejiang provinces and the municipality of Chongqing Sunday will aid local authorities in combating the floods, said Zhang Zhitong, vice director of the office.